UNESDA: European soft drinks industry sets ambitions to make its plastic packaging more sustainable. The ambitions aim to contribute towards building a circular model for plastic packaging by improving its recyclability, recycled content, collection, and reuse. 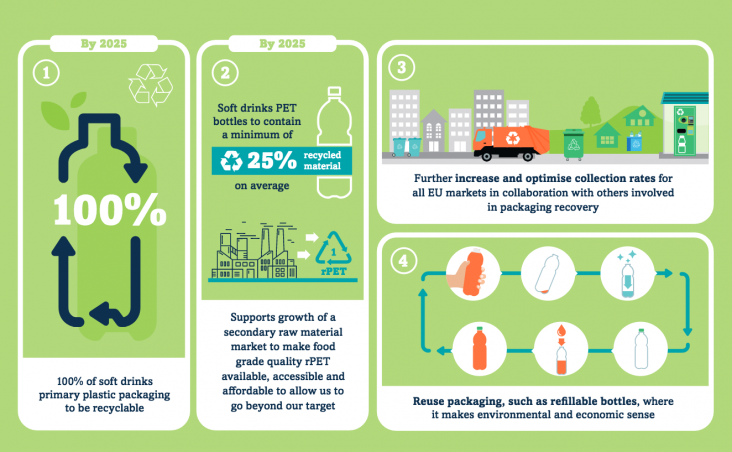 Beverage packaging is the most collected packaging in the EU and large soft drinks companies have been instrumental in driving up recycling rates by establishing and running many of the packaging recovery organisations across the EU. The sector has already taken significant steps to make soft drinks packaging more sustainable and reduce its carbon footprint – including light-weighting programmes to reduce the amount of raw materials used; increasing the use of recycled materials and removing technical barriers to recyclability. UNESDA´s ambitions to make plastic packaging more sustainable.